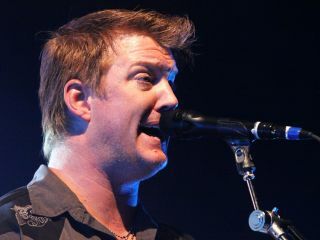 Them Crooked Vultures frontman Josh Homme has signed on as ambassador for this year's Record Store Day, which takes place on 17 April, and he's made a little video to talk about it. Let's face it: in this age of downloads and file sharing, music, it's easy to lose sight of the joys of physical recordings - the artwork, the discontinued releases, and of course that old Boston eight-track tape you've always lusted after. Record Store Day encourages music fans to get back to the good ol' days, when they could visit their local independent record shop and sample the wonders and treasures contained within. As in the past, Record Store Day will be celebrated through a combination of live in-store appearances and special one-off releases only available in participating stores on the day itself. And it's not just a US-based event. Check out this website for information on UK retailers participating in Record Store Day. In the video below, Josh Homme - uh, we mean Ambassador Homme - talks about how "indie record stores are a hotbed of discovery - and bacteria - for music lovers both young and old, filled with aisles and aisles of hot and tasty gems, imports, picture discs...all to help you develop that sense of individuality as you come to that age where it's time to discover your own theme music. "There's only two ingredients necessary on Independent Record Store Day: that's you and the independent record store. Put those ingredients together and give yourself and your loved ones the 'eargasm' you deserve."